The Guatemalan cabinet ministers for the environment, the interior, and energy and mines stepped down May 21 amid corruption scandals and massive protests. Investigations into alleged irregularities in mining, energy, and other environmental project contracts and permits have been thrust back into the spotlight. Mining and energy projects in the country have faced intense community resistance, which has often become the target of crackdowns by state and corporate security forces. Five government officials were on the chopping block May 21: Michelle Martínez, Minister of the Environment and Natural Resources; Edwin Rodas, Minister of Energy and Mines; Mauricio López Bonilla, Minister of the Interior; Ulises Anzueto, Secretary of Strategic Intelligence; and Edy Juárez Prera, Vice Minister of Security. 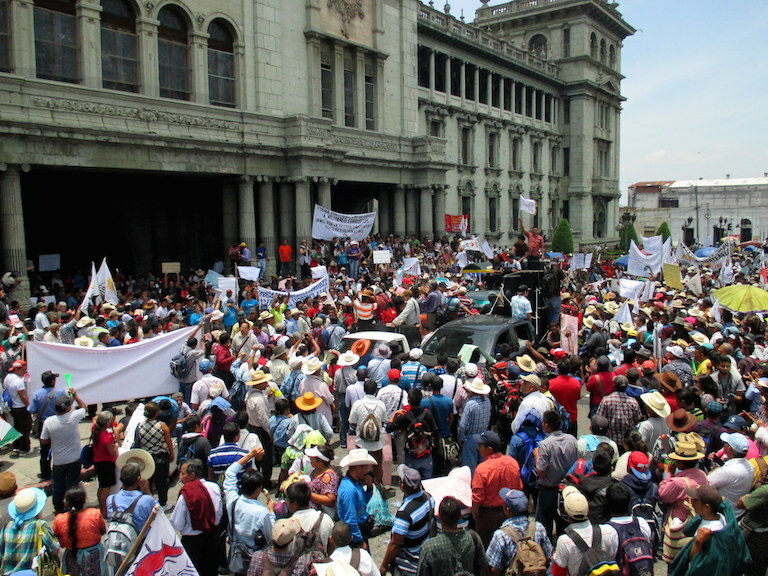 A crowd gathers at a May 20 march and rally in Guatemala City over recent revelations of widespread government corruption. One of the banners calls for the nationalization of electrical energy and a halt to mining. Photo by Sandra Cuffe. “I’m making the changes I consider necessary,” President Otto Pérez Molina said at a May 21 press conference, stating that he asked the cabinet ministers for their resignations two weeks earlier. “The government is not collapsing,” he said, dismissing claims to the contrary. The previous Minister of Energy and Mines, Erick Archila, had resigned May 15, but his successor, Rodas, didn’t last the week. Several cabinet ministers including Archila and Martínez were already the targets of court and congressional proceedings to strip them of their immunity from prosecution due to allegations of corruption. Their offices automatically conferred immunity. Now they and the others who have left their posts are open to potential prosecution. 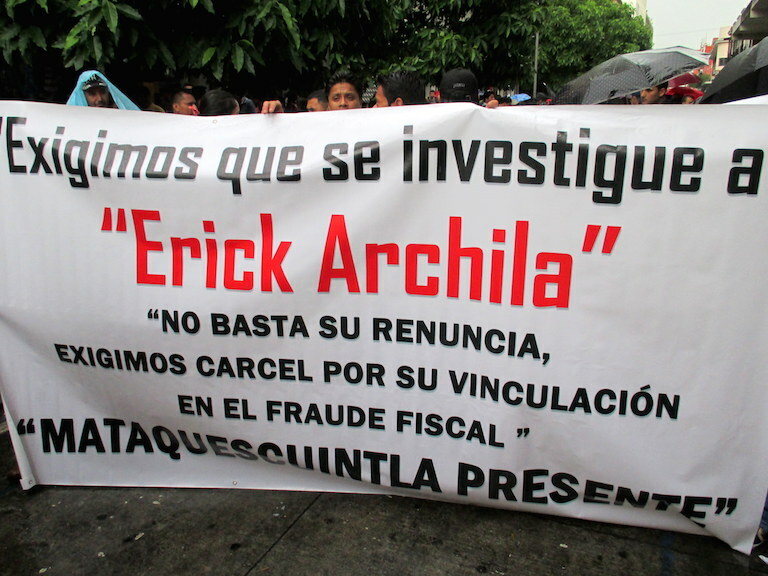 Protesters hold a banner calling for an investigation and jail for Erick Archila, the Minister of Energy and Mines who resigned May 15 over accusations of corruption, at a massive protest in Guatemala City on May 16. Protests took place throughout the country that day. Photo by Sandra Cuffe. The cabinet changes stem from events beginning on April 16, when Guatemalan prosecutors and the UN International Commission against Impunity in Guatemala (CICIG) cracked down on a criminal network defrauding the state of an estimated $120 million in customs revenue from within the National Tax Office. On May 20, prosecutors unveiled another multi-million-dollar corruption case within the Guatemalan Social Security Institute (IGSS). More than three dozen people have been arrested, including the president of Guatemala’s central bank, the Bank of Guatemala, current and former heads of the National Tax Office, the president of the IGSS board of directors, other government officials, and high-profile lawyers. Four judges are under investigation and may face formal proceedings to strip them of their official immunity. The allegations of corruption go to the innermost circles of power. The suspected ringleader of the tax theft network, currently a fugitive, was the private secretary of Vice President Roxana Baldetti. Although Baldetti herself has not been formally accused of involvement, she resigned May 8 and a new Vice President was sworn in May 14. One of the officials at the center of the social security scandal was President Pérez Molina’s own private secretary before the president appointed him to head the IGSS board. Public outrage at the government over the corruption scandals has given rise to a decentralized people’s movement. Marches and rallies demanding Pérez Molina’s resignation are growing. An estimated 60,000 people participated in a protest in Guatemala City on May 16, and thousands more hit the streets in towns and cities around the country. 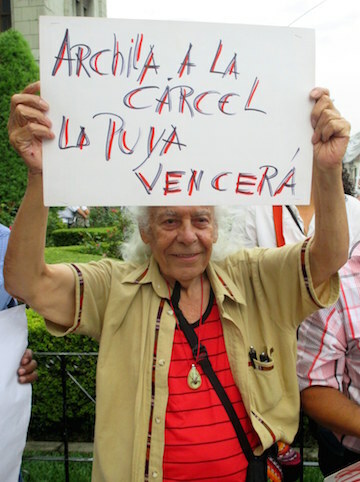 A protester demands jail for Erick Archila, the Minister of Energy and Mines who resigned May 15 over accusations of corruption, at a massive protest in Guatemala City on May 16. Photo by Sandra Cuffe. “We came to the protest against Otto Pérez Molina because there is so much corruption,” Cobo told mongabay.com in Guatamala City’s central plaza, as the protest was winding down.Feliciana Cobo left home at midnight to make it to Guatemala City in time for a march and rally on May 20. Thousands of indigenous people and small-scale farmers traveled from all corners of the country to the capital to call for the president’s resignation and voice a host of other wide-ranging demands, including the nationalization of electrical energy and a halt to mining operations in the country. As the color and pattern of her traditional dark-red woven skirt indicated, Cobo came from Nebaj, in the Maya Ixil region of Guatemala’s Quiché department. The Ixil triangle is one of the regions where a UN truth commission concluded that state armed forces committed acts of genocide against Mayan civilians during the 36-year internal armed conflict that ended in 1996. 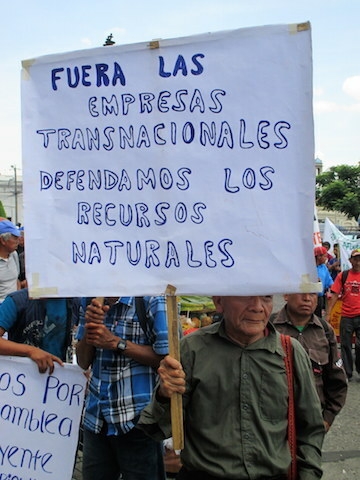 A protester at the May 20 demonstration in Guatemala City carries a sign reading “Out With Transnational Corporations; Let’s Defend Our Natural Resources.” Photo by Sandra Cuffe. Energy privatization and the construction of new high-voltage transmission lines and hydro-electric dams amid rural populations have been sparking conflict around the country for years. Community protests are often met with militarization and force. On April 28, a large police contingent was sent up into the Ixil region to evict a road blockade set up by community residents affected by the construction of the Xacbal Delta hydro-electric dam, according to news reports. The arrests of three locals sparked other blockades and protests. 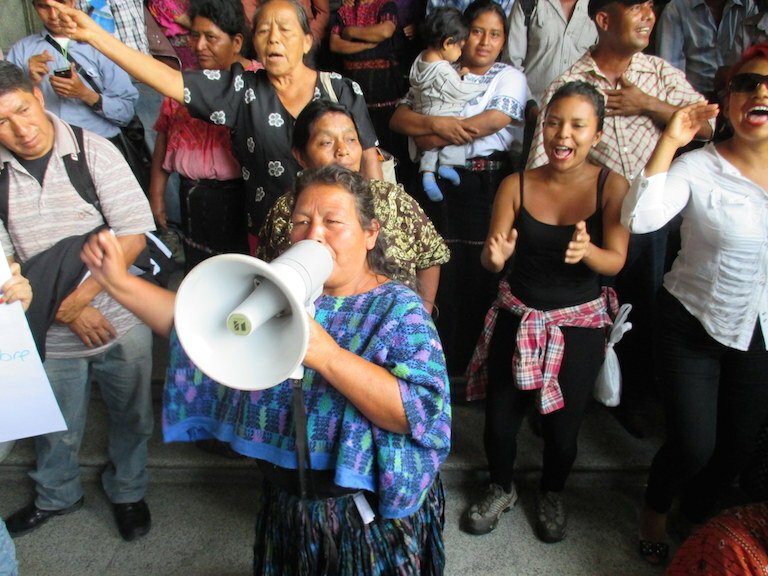 The situation calmed down when local traditional Ixil authorities negotiated the release of the detainees, but not before soldiers arrived or before tear gas rained down on protesters and homes in the town of Chajul. Another hydro-electric dam is the subject of one of the cases of alleged corruption within the Ministry of Energy and Mines. Archila, the minister who resigned May 15, has been under investigation by the National Comptroller’s Office over alleged irregularities in and overpricing of energy contracts. The approval of a contract for a pre-feasibility study of the Xalalá dam in the Quiché department has been under scrutiny since last year. And a mining exploration license granted to Minera San Rafael, a subsidiary of the Canadian mining company Tahoe Resources, has also been called into question over the environmental assessment for the exploration project. The Center for Legal, Environmental and Social Action (CALAS) took the matter to court and won a temporary suspension of the Juan Bosco exploration license. CALAS brought a separate case against Ministry of the Environment officials to an administrative tribunal, which is examining the approval of the environmental impact assessment underpinning the license. Marta Carrera lives in San Juan Bosco in the Santa Rosa department. It is one of the communities located within the 23 square mile Juan Bosco mining exploration license. 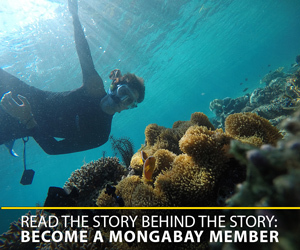 “We were never consulted,” Carrera told mongabay.com. A member of the communities’ Committee in Defense of Life and Peace, she has been actively involved in the local opposition to an operating mine owned by Tahoe Resources, the Escobal silver mine roughly eight miles from her home. “We’ve spoken out and organized peaceful protests,” she said. Minera San Rafael company security personnel opened fire on protesters on April 27, 2013, wounding several people. The incident and subsequent massive police presence provoked clashes, and on May 2, 2013, the government declared a state of siege in three municipalities, militarizing the region and suspending basic rights and freedoms. Community leaders were targeted with raids and criminal charges, according to human rights organizations. Carrera’s own brother, the president of a local Community Development Council, spent seven months in detention before all charges against him were dropped. Protesters demonstrate against government corruption outside the National Palace in Guatemala City on May 20. Photo by Sandra Cuffe. One of the judges presiding over some of the dozens of criminal cases brought against community leaders and organizers in the wake of the state of siege, Carol Patricia Flores, is now under investigation for her alleged involvement in the National Tax Office scandal. However, aside from the Juan Bosco exploration license, the most prominent scandal involving the Ministry of the Environment and Natural Resources concerns the clean-up of Lake Amatitlán, just south of Guatemala City. The ousted minister Martínez supported an $18 million contract for M. Tarcic Engineering Ltd. to stop and reverse pollution of the lake, using an unspecified liquid in the process. Analysis conducted by the Ministry of Health and the Office of the Special Prosecutor for the Environment concluded that the between 97 and 98 percent of the liquid’s ingredients are nothing more than water and salt, the Guatemalan newspaper Prensa Libre reported. The Attorney General’s Office is calling for the engineering firm to return the three million dollars it has already received. Just as attention to the customs revenue scandal spilled over into a resurgence of activity in separate investigations into other executive and judicial branch officials, protesters have moved beyond initial demands for Vice President Baldetti and President Pérez Molina’s resignations. As the citizen’s movement against corruption moves forward, the demands of its diverse participants have broadened to include environmental justice issues and systemic change. The May 20 protest was a case in point. Organizers from the Campesino Development Committee (CODECA) called for a “plurinational popular constitutional assembly process” with ample representation from indigenous peoples and other disenfranchised sectors to establish a new constitution and transform the state. Demonstrators from around the country demanded the nationalization of electrical energy, freedom for political prisoners, solutions to agrarian conflicts, and a stop to mining. “During the last few administrations and especially during this military government, monoculture crops, mining, oil, and hydro-electric extractive industries have invaded and pillaged people’s territories with impunity, with the consent of successive governments,” states a communiqué online May 8 by CODECA and two coalitions of land-rights groups, the National Coordination of Campesino Organizations (CNOC) and the Verapaz Union of Campesino Organizations (UVOC). The organizations also denounced the criminalization of community leaders. “The response to the reports that social organizations have been making is to kill them, persecute them [and] jail them,” the communiqué continues. A woman led a crowed in chants demanding President Otto Pérez Molina’s resignation. The crowd was gathered right next to the gates of the National Palace in Guatemala City on May 20. Photo by Sandra Cuffe. The recent arrests and resignations of high-level officials have not assuaged protesters. For now, the overarching demand is still Pérez Molina’s resignation. Carlos Orozco traveled more than 100 miles from his home in Totonicapán to Guatemala City to add his voice to the growing clamor for the president to step down. On May 21, Pérez Molina reiterated his plans to complete his term in office, which ends in January 2016. General elections are scheduled for September 6. 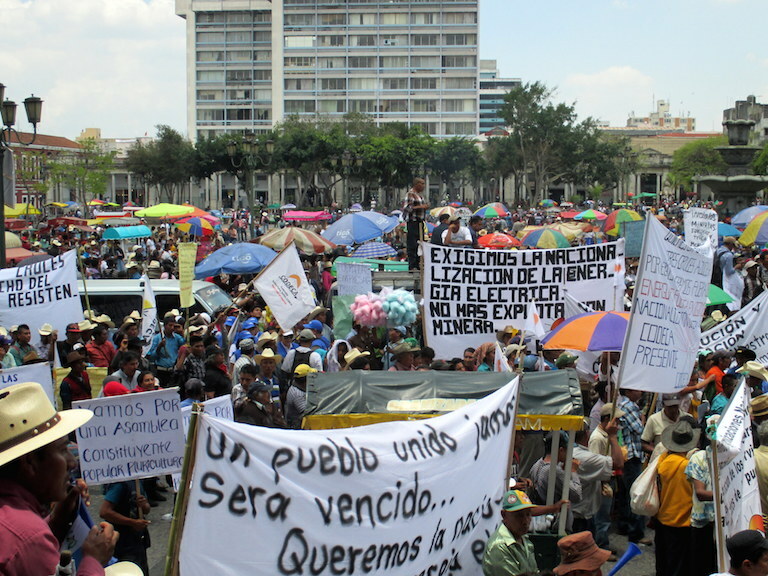 As the grassroots movement in the streets continues to gather momentum and consolidate visions of the Guatemala it wants, it seems increasingly likely that even if Pérez Molina steps down the mobilizations for justice and systemic change will continue.